A HyperV Virtual Machine that I had been using for over 1 year suddenly started slowing down when logging in via remote desktop. It got to the point where it was taking 4 or 5 attempts to login and costing about 15 minutes every morning. I have now also noticed it is taking approx 10 minutes to shut down when performing a reboot. Ok, this problem has been driving me crazy, and each time I apply a “fix” I find a week later that I am back to having problems. I have left the sum total of the trouble shooting that I have done, in the previous solutions further down, but this latest solution seems to be the one. Note: this fix is done on the guest. I have changed nothing on the hyper-v host. The issue of slow logins was also compounded recently with really slow shutdowns. I applied some patches and needed to reboot the guest and had to wait 10 minutes. I tested this a few times, by pinging the server during a reboot and (ping server.domain.com -t), and waiting for lost packets. It would take about 8 minutes before the packets were being dropped. After one of these reboots, I opened event viewer and looked at the “System” logs. I noted that during the shut down there was a heap of “service x has shut down” messages, but then there was a 6 minute gap followed by a Warning message from the “Windows Remote Management” service, WinRM. The WinRM service is not listening for WS-Management requests. I decided I could try living without this service, so I found the “Windows Remote Management” service disabled it and stopped it. Now, my computer shuts down (to lost ping) in less than 10 seconds and I have not had a slow login since. I would appreciate if anyone else can confirm this works for them. The item to note is the “Remote Access” configuration. 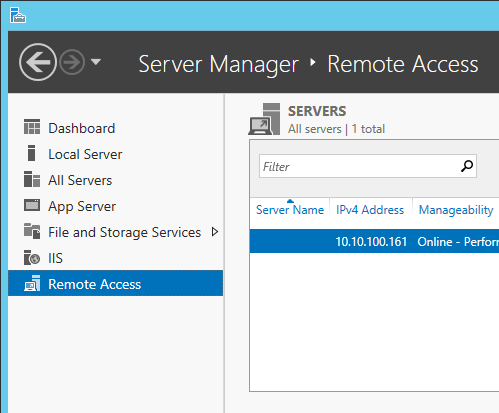 Somehow I had installed Remote Access? Don’t remember doing it, but there you have it in plain sight, so I must have installed it by accident. Since doing this my logins via mstsc / rdp are normal again. Goes to show you can’t trust everything you read on the internet. Everything below was my original investigation and attempt at resolving the problem, and it seemed to fix things but ultimately it was not the solution. I have left the details here as it may help describe other problems. I finally looked into the event log and found that I was getting the following error every 45 seconds. Sorry, this has not resolved my slow login problems. It has has help improve the performance of the box sligthly and I have definitely stopped the errors in my event log, but it has not resolved the slow login screen. I will keep trying and if I get a resolution I will bump the vmicvss issue to its own post and put the definitive solution here. Save the following into a .reg file and then execute on your computer to stop the error occurring. The registry change will stop the errors but it will not stop “Information” event log entries being written every 45 seconds. 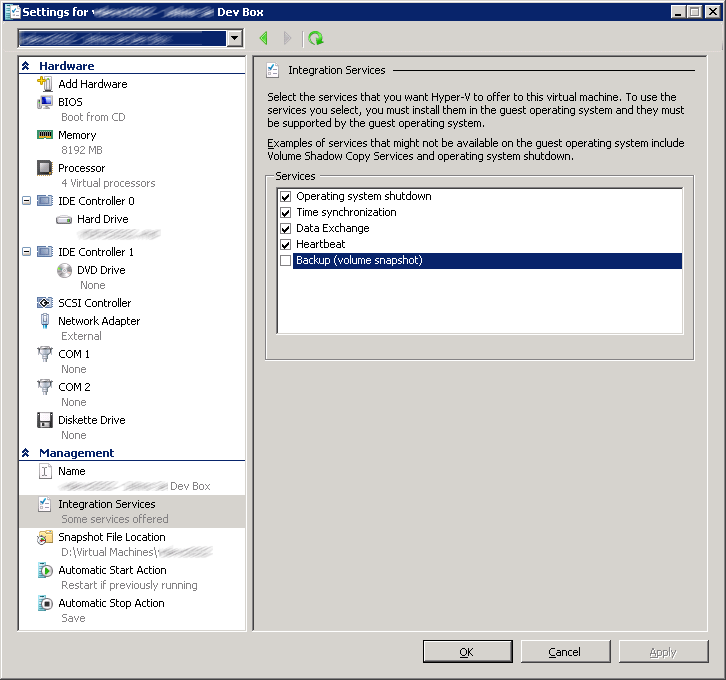 You need to login to the HyperV host and edit the settings of you VM. I also cleared my event log and things seem to be running much more smoothly . P.S see the comments. this may be a side effect of Dell Equalogics auto-snapshot software. Interesting…I don’t understand why you were seeing that error every 45 seconds. All day? I only had five instances once per day, during the host backup. Not sure what informational messages you are referring to. I wonder if your host was repeatedly trying and failing to do a backup. Did you check the various Hyper-V event logs on the host? For slow logins, the first thing I check is DNS. Yes, I was getting the error in my logs every 45 seconds. (Interestingly this box is running on Dell EqualLogic SAN storage). When I followed your instructions of updating the registry as per your blog post, I found that the errors, stopped occurring and were replaced with similar “Information Entries” in the event log, again every 45 to 50 seconds. No snapshots are present in the system. Having disabled this, the anecdotal evidence to date is that my login experience to my virtual machine has improved. I have a colleague who has been complaining of poor performance in his VM, I will be checking to see if he is sufferening the same issue. I think this is stating to point to an EqualLogic error. I am not responsible for these servers, but having a look it appears that Dell has some software called “Dell Equalogic Auto Snapshot Manager”. This appears to have a configuration warning around “Error: Connecting to control Group”. I will follow this up with our infrastructure team and see if this is the reason for the errors. Finally, I was curious as to what you would investigate in DNS for the slow Login? Sounds like you’re in a much larger site than my 1-server home office :). DNS: in a domain, machines usually need to point to a domain controller as their first DNS. If they don’t, e.g. if they pull DHCP from a router that only points at the public Internet, they may never find the server that validates their login. P.S. Any reason not to enable the HV VSS integration service (I think that’s called the Backup service in the settings for the VM)? Stupid that it tells you that every 45 seconds though. I believe the fact that HyperV the backup service is attempting some kind of backup that is failing every 45 seconds, is causing the guest to suffer to the point where I am unable to login Via RDP. I may be drawing a long bow and incorrectly suggesting the Login error is due to the vmicvss error but I will see how the server goes over the next few weeks and confirm whether they are related. As I said I also have another colleague who is potentially experiencing the same issue, so I may have a sample size of two to test with. Thank you!!! This helped me fix the “Please wait for the Local Session Manager” message on Windows 8.1. The solution for me was to disable Remote Assistance in Advanced System Properties / Settings -> Remote tab. After installing several virus scanning applications (including Sophos, which seems to be known to cause this) on a recently infected computer, remote desktop connections took forever and sometimes never connected at all. Uninstalling the virus scanners didn’t help, nor did disabling all services with msconfig. Would be a shame if I ever wanted to enable remote assistance I guess. I guess that’s what TeamViewer is for.